Independent Bergerie, capacity 4 people, made of stones and wood, with all the modern comfort. Comfortable, quiet and spacious with its 80 square meters, very well insulated, equipped with electric central heating with regulation and electronic programming, high-end bedding antiallergic in all rooms whose shutter windows doors are made by shutters electric, bathroom comfort with walk-in shower, 2 separate toilets with washbasin, fully equipped kitchen with induction table, oven pyrolysis, microwave oven, fridge freezer, dishwasher, washing machine etc. Multimedia equipment in the Bergerie Satellite TV, TNT SAT, and foreign TV channels, DVD / DIVX player, PC computer connected Internet, WIFI. Located on a plot of 3000 m² at 900 meters above sea level, La Bergerie de Sentantony is on the edge of the path of transhumance and departures hiking trails or mountain biking. Hiking in the Pyrenees National Park to discover the wild environment of the fauna and flora of the mountains. Make mountain bike tours, some of which leave in front of the Bergerie. Practice Nordic skiing or cross-country skiing at the Couraduque ski resort. Practice downhill skiing or summer tobogganing in the ski resorts of Cauterets or Hautacam. Browse streams and mountain lakes for wild trout fishing. Climb in the mountains or cliffs. Make the zip line at the neck of Soulor. Cycling the ascent of the great passes of the Tour de France, neck of soulor, Aubisque or Tourmalet. Visit the observatory of the Pic du Midi de Bigorre 2900 meters. See the circus of Gavarnie Mount Perdu and the Breche de Roland - UNESCO World Heritage. Climb the 3000 of the Pyrenees. Go down the river rafting, canoeing or kayaking. Trout fishing in lakes or mountain rivers. Make the circuit of water mills of Gaillagos. Take a swim in the lakes, the Arrens Marsous swimming pool or the Lac Vert leisure center. Observe the birds and especially the big Pyrenean raptors. Make gourmet breaks in the excellent restaurants of Viscos, Flavors of Azun or Arrieulat. Visit the Mecca of the French pilgrimage, the grotto of Lourdes and the castle of Lourdes. Parts of 9 square meters, while earthenware tiles mocha and natural wood, large walk-in shower Rainfall Showerhead with lighted wall electric towel radiator + blowing. 2 separate toilets suspended bowls. Floorplan: Kitchen: Fridge large capacity freezer - Dishwasher - Stove Induction - Cooker hood - pyrolysis oven - Microwave - Coffee maker - Kettle - Pressure cooker - dining area for 4 people - Built laundry washing machine. WC: Separate toilet with washbasin suspended. Living room: 2-seater sofa + 2 armchairs - coffee table - Furniture + TV TNT SAT - DVD Divx - base cabinet with computer + internet + Wifi - Library. Mezzanine: sitting area, reading chair nap + futon - storage. Bathroom: storage furniture - 1 sink - large Italian shower thermostatic tap - towel radiator + blowing. WC: Independent suspended bowl. Bedroom 1: bed 2 pers. 140 - Pompadour armchair - storage cabinet - chair - small office. Bedroom 2: 2 beds 1 pers. 90 - wardrobe - chairs - small office. Electric central heating with centralized planning and regulation. VMC. 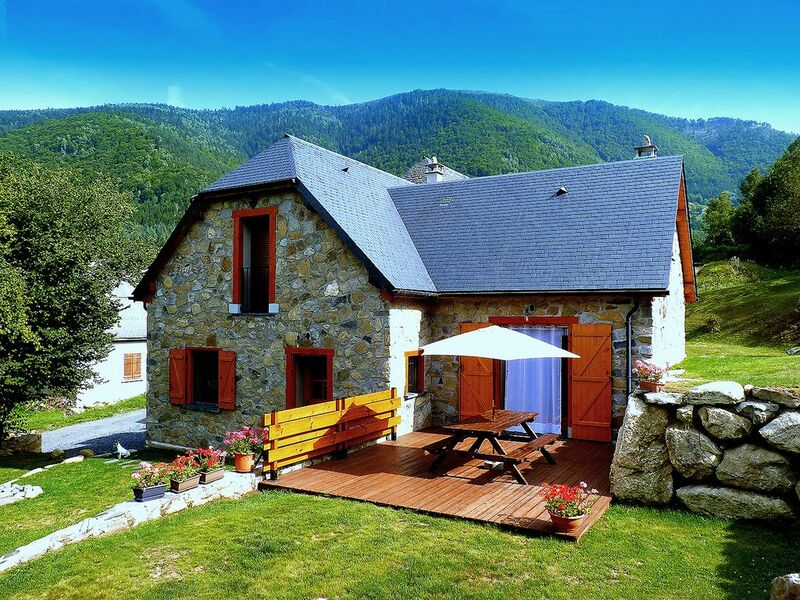 This gite is nestled in a perfect location in the Hautes-Pyrenees. It is close to everything you want to do. And there is a lot to do in this area. We were never more than an hour away from anything. It is also close to a great village with everything you need. Grocery store, shopping, butcher, baker and frommage shop. Marianne and Oliver were perfect hosts. They had maps available and restaurant recommendations for us. They spent time with us to help us orient ourselves to the area. (There is much to do here in the Pyrénées). The gite was spectacularly clean and well equipped. I would recommend the La Bergerie de Sentantony again and again!!! It was a PERFECT month in France!!! We thank you for this positive opinion on the Bergerie of Sentantony, we are happy that you could enjoy your long stay in the Hautes-Pyrénées by staying at the cottage of the Bergerie of Sentantony. The Val d'Azun did not completely reveal all its secrets. You are a very friendly and dynamic couple of visitor who arrived from the USA, and we enjoyed your stay, for your discretion, your respect of places and our exchanges on our region. Note that Mr. likes to cook. It will be with great pleasure that we will welcome you to the Bergerie of Sentantony during one of your future travels in the Val d'Azun. Beautiful position, very well appointed, comfortable and attractive property. The property is a relatively new, purpose built gite with 2 spacious bedrooms which easily accommodate 4 adults with good storage in each room. The shower room is large incorporating a separate toilet. The mezzanine provided a quiet space to sit and read. The ground floor comprises a large sitting room, kitchen/diner and toilet. The sitting room has comfortable seating, a computer and television, plentiful local information and maps, books and games. The kitchen/diner was very well equipped with plenty of crockery and glassware and cutlery, etc. Residents have access to the garage for additional storage, eg, for boots, and an airer for washing. The garden was large, stocked with beautiful trees and a large patio area with outside seating, picnic table, parasol, barbecue, etc. Marianne and Olivier were very welcoming and spent time introducing us to the property and the attractions of the area whilst taking into account our interests. The owners live in the adjacent property and were available if needed but were in no way intrusive. We would very happily return to the property and the area and would have no hesitation in recommending it highly. Had a lovely stay at The Mountain nature House. The owners were very friendly and helpful. Although the holiday cottage is attached to the owners house they respect your privacy and leave you alone. The house itself is very clean comfortable and well equipped. However, you do need to the your own towels. We forgot but the Marianne and Olivier kindly gave us some. The house is also in a beautiful location with all tourists sights within easy reach. The town of D'Argeles-Gazost is a lovely bustling town with a market, shops selling regional foods and a number of restaurants and cafes. We had a wonderful few days at the cottage and really enjoyed what the area has to offer. Would definitely go back. Perfect place for us - secluded and picturesque. La Bergerie was a perfect place for us - quiet, secluded and picturesque. And easy to find in the village - to the church and up and up and up the hill. All cottages were well numbered. The owner spoke enough English to be perfectly well understood. The booking and whole process both beforehand and while we were there was an excellent service. The cottage was clean and beautifully furnished and finished. And all necessary mod-cons and utensils were in place - from a teapot to toilet rolls. Satellite TV had the expected BBC World, Sky News, CNN and some Eurosport in English. There were board games and books available too. And DVD player. Driving and navigating from Lourdes-Tarbes to Bun was easy - 45 minutes or so. All our hiking routes were easy to find and park (for free). This was also the main Carrefour supermarket for big shopping. Other smaller shops existed in Arrens-Massous, including bread/patisserie and charcuterie. Plus a good tourist information office (although there was enough information for hiking maps/routes in the cottage to not necessarily require a visit here). Driving the narrow roads through villages means being slow and careful - stick to the given speed limits because there is no need to rush. Cauterets Pont d'Espagne Vignemale Gaube Lake Grands Sites Midi-Pyrenees. The peak of the South of Bigorre 2900 meters with its astronomical observatory: night of the stars. Mythical passes: Tourmalet, Aubisque, Soulor ... The Pyrenees National Park. 3 thermoludic centers Argelès-gazost, Cauterets, Luz-Saint-Sauveur. Pyrenees wildlife park in Argelès-Gazost - Acrobranche park in Argelès-Gazost. Hiking, snowshoeing, skiing and mountain climbing all levels. Large ski resort of Val d'Azun Hautacam and Cauterets. Mountain Luge Trail. Gourmet restaurants: The Viscos in Saint Savin - L'Arrieulat and the Casaou in Argelès-Gazost - The Flavors of Azun in Gaillagos. World Pilgrimage Center in Lourdes. Tarifs des options que vous pouvez ajouter à votre séjour : - ménage fin de séjour : 45 euros. Le gîte rural La Bergerie de Sentantony est labellisé par les Gîtes de France sous le numéro 65G1849101. Vous pouvez réserver une semaine scindée ou un week-end uniquement en période Basse ou Moyenne saison hors vacances scolaires.